A witness told air accident investigators that a plane which crashed killing a young boy and pilot was flying “sideways” before it impacted a Co Offaly bog last month. 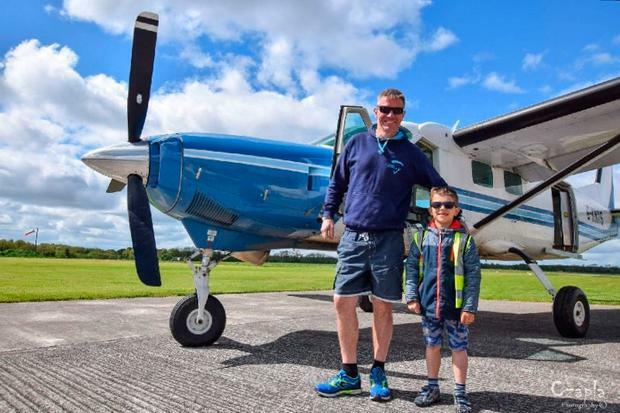 English pilot Neil Bowditch (47) and 7-year-old Kacper Kacprzak, who lived in Dublin, died in the crash shortly after 16 skydivers had jumped from the Cessna Grand Caravan plane on Sunday, May 13. Investigators revealed that the crash was recorded on CCTV footage from a nearby windfarm and from cameras worn by some of the 16 parachutists who jumped uneventfully shortly before the crash. It was also witnessed by a number of people on the ground. One witness who was 750 metres from the crash site described the plane flying “sideways” and said it was “low down” prior to the crash. Another witness told investigators he heard the sound of an aircraft engine, “looked up and saw the aircraft coming straight down, nose first, before it disappeared below a line of trees, located to his north-west.” This was followed by what the witness described as a thump. CCTV footage from a nearby wind farm and training facility has also been examined. “The imagery from a number of the cameras appears to briefly show the aircraft, in flight, in the distance, before it assumed a steep, nose-down attitude and descended below a line of trees as it approached the ground,” the report notes. “Several of the parachutists provided the Investigation with video recordings of their jumps. One of these recordings appears to show the aircraft for approximately one second, as it descended below a line of trees in the distance,” the report stated. As it is a preliminary report, the AAIU has not reached any conclusions or made any recommendations and the investigation is ongoing. A full report will be published at a later date.